Soldiers in formation. 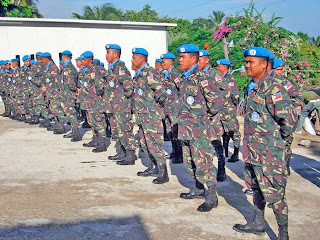 Just want to share the photo of my friend’s husband, who was part of the Philippine contingent sent to Haiti for a peacekeeping activity in 2005. This was their usual formation while they are assigned in the now earthquake-devastated nation. Technical Sergeant Manuel Añain, of the Philippine Marines is second from right. My friend who is also my kumare is thankful that her husband’s deployment in Haiti had ended long before tragedy struck. But she is also sorry for the families of soldiers who died doing their duty. Let us pray for the repose of the souls of those who perished in the tragedy. This entry was posted in Uncategorized and tagged friends on January 14, 2010 by Mommy Yam. Blog’s new look – Thanks Pehpot and Kaye! Merci, Agyamanak, Xie’ Xie’ Ni, Gracias, dankie, Mahalo, grazie, thank you, salamat. New Year, new look. I can’t thank my Marce Pehpot and Marce Kaye enough for the collaborative effort they put on in beautifying my new site, yamtorrecampo.com. The colors are cool and the layout design is apt for the site’s theme. I can’t ask for more. This will certainly inspire me to update and promote the new site aside from the existing blogs that I have. This entry was posted in Uncategorized and tagged friends on January 8, 2010 by Mommy Yam. Life is too short to grumble or complain about the little hitch that we experienced last year (2009). These obstacles have somehow made us stronger to face life’s uncertainties. I have my own share of ups and downs, but they never stop me from pursuing the things that made me happy. Looking back, here are some of the things that I’m thankful for. I have a family who I love so dearly and depend on in some trying moments. I have a husband who is loving, understanding and responsible. He’s a resourceful person too. I have two obedient and smart kids. We live a simple life, but we are abundant in love and respect for one another. We never let big and small misunderstanding ruin all our good times together. That’s our family motto by the way. I’m thankful that our household and the extended family are in the pink of health. The only serious ailment I’ve attended to so far was flu and the common cough and cold. The past year was an exciting one for me too. I have learned to write a blog and meet close to a hundred mommy bloggers along the way. Most of them are stay at home mom like me. A handful is now my ‘kumares’ (Marce Club). I’m also excited to share that I was able to earn a little from blogging . It’s not that much but at least hubby is happy that his wifey knows pratical resources to help us get by. I’m also thankful that I still have more time to maintain three blogs (this site, Yam’s Files and Pen, paper, pan) despite my being busy with endless workload at home. I’m thankful for friends Marce Pehpot for the header and footer layout of my new blog; Marce Kaye for the intricate code; and Mylene also for the technical stuff she’s teaching me. I’m thankful that my mother is still strong despite her age; and for my sister that she was able to find a good job abroad; my maternal aunt who is recuperating from cancer; and my cousin who finally tie the knot this year. I’m also thankful for all the things that I failed to remember, but somehow made an impact on my life. Hopefully next year life will be kind to all of us that all the wishes of our heart will come true. Lastly, I’m thankful for Mylene of Online Mommy’s Corner for coming up with this wonderful contest. Head on to her site to see what’s in store for the lucky winners. This entry was posted in blog contest and tagged blog contest, family, friends on December 30, 2009 by Mommy Yam.